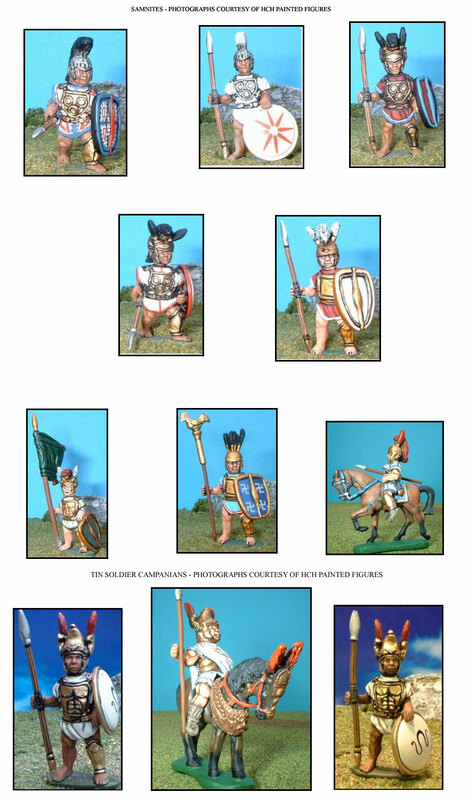 CODES 1 - 8 OF THE SAMNITE RANGE CAN BE USED AS CAMPANIANS IF HOPLON SHIELD IS SUBSTITUTED (PLEASE REQUEST IF HOPLON WANTED) ALSO SELECT FIGURES FROM OUR ETRUSCAN OR GREEK RANGES. CODES 1 - 8 OF THE SAMNITE RANGE ARE SUITABLE FOR OSCAN INFANTRY BY USING CIRCULAR OSIER (WICKER) SHIELDS IN PLACE OF THE SAMNITE TYPES (REQUEST IF OSIER TYPE WANTED), ETRUSCANS AND SAMNITES SOMETIMES USED THE PILUM HEAVY JAVELIN IN PLACE OF OR IN ADDITON TO THE SPEAR. THESE CAN BE PURCHSED IN PACKS OF 8 IF REQUIRED.